The Curious Wavefunction: Physicist Leo Kadanoff on reductionism and models: "Don't model bulldozers with quarks." 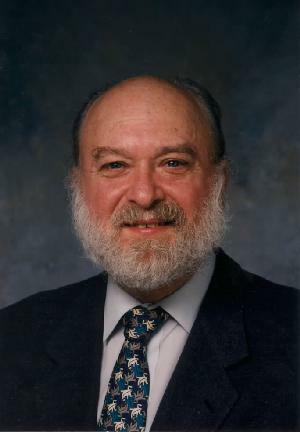 Physicist Leo Kadanoff on reductionism and models: "Don't model bulldozers with quarks." I have been wanting to write about Leo Kadanoff who passed away a few weeks ago. 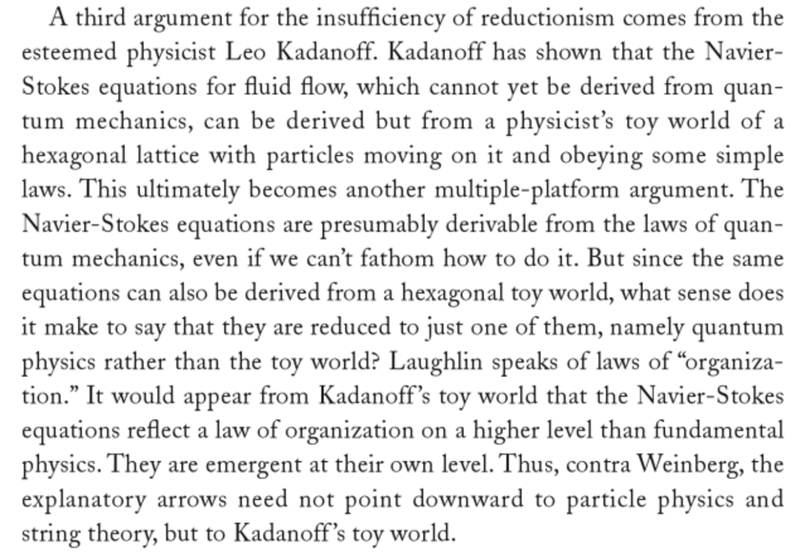 Among other things Kadanoff made seminal contributions to statistical physics, specifically the theory of phase transitions, that were undoubtedly Nobel caliber. But he should also be remembered for something else - a cogent and very interesting attack on 'strong reductionism' and a volley in support of emergence, topics about which I have written several times before. Kadanoff introduced and clarified what can be called the "multiple platform" argument. The multiple platform argument is a response to physicists like Steven Weinberg who believe that higher-order phenomena like chemistry and biology have a strict on-on-one relationship with lower-order physics, most notably quantum mechanics. Strict reductionists like Weinberg tell us that "the explanatory arrows always point downward". But leading emergentist physicists like P W Anderson and Robert Laughlin have taken objection to this interpretation. Some of their counterarguments deal with very simple definitions of emergence; for instance a collection of gold atoms have a property (the color yellow) that does not directly flow from the quantum properties of individual gold atoms. Kadanoff further revealed the essence of this argument by demonstrating that the Navier-Stokes equations which are the fundamental classical equations of fluid flow cannot be accounted for purely by quantum mechanics. Even today one cannot directly derive these equations from the Schrodinger equation, but what Kadanoff demonstrated is that even a simple 'toy model' in which classical particles move around on a hexagonal grid can give rise to fluid behavior described by the Navier-Stokes equations. There clearly isn't just one 'platform' (quantum mechanics) that can account for fluid flow. The complexity theorist Stuart Kauffman captures this well in his book "Reinventing the Sacred". Others have demonstrated that a simple 'bucket brigade' toy model in which empty and filled buckets corresponding to binary 1s and 0s (which in turn can be linked to well-defined quantum properties) that are being passed around can account for computation. Thus, as real as the electrons obeying quantum mechanics which flow through the semiconducting chips of a computer are, we do not need to invoke their specific properties in order to account for a computer's behavior. A simple toy model can do equally well. 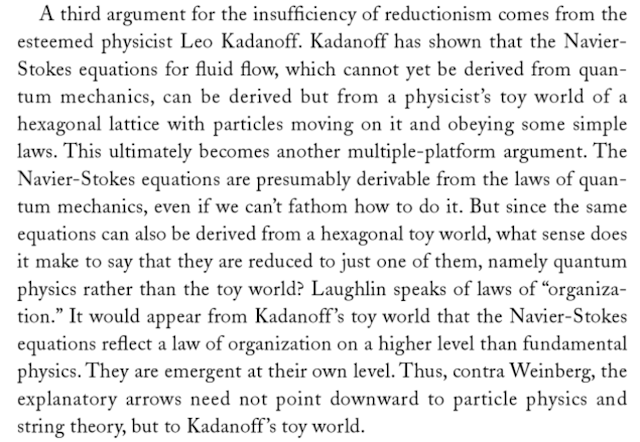 Kadanoff's explanatory device is in a way an appeal to the great utility of models which capture the essential features of a complicated phenomenon. But at a deeper level it's also a strike against strong reductionism. Note that nobody is saying that a toy model of classical particles is a more accurate and fundamental description of reality than quantum mechanics, but what Kadanoff and others are saying is that the explanatory arrows going from complex phenomena to simpler ones don't strictly flow downward; in fact the details of such a flow cannot even be truly demonstrated. "1. Use the right level of description to catch the phenomena of interest. Don't model bulldozers with quarks. 2. Every good model starts from a question. The modeler should aways pick the right level of detail to answer the question." "This lesson applies with equal strength to theoretical work aimed at understanding complex systems. Modeling complex systems by tractable closure schemes or complicated free-field theories in disguise does not work. These may yield a successful description of the small-scale structure, but this description is likely to be irrelevant for the large-scale features. To get these gross features, one should most often use a more phenomenological and aggregated description, aimed specifically at the higher level. Thus, financial markets should not be modeled by simple geometric Brownian motion based models, all of which form the basis for modern treatments of derivative markets. These models were created to be analytically tractable and derive from very crude phenomenological modeling. They cannot reproduce the observed strongly non-Gaussian probability distributions in many markets, which exhibit a feature so generic that it even has a whimsical name, fat tails. Instead, the modeling should be driven by asking what are the simplest non-linearities or non-localities that should be present, trying to separate universal scaling features from market specific features. The inclusion of too many processes and parameters will obscure the desired qualitative understanding." This paragraph captures as well as anything else why chemistry requires its own language, rules and analytical devices for understanding its details and why biology and psychology require their own similar implements. Not everything can be understood through quantum mechanics, because as you try to get more and more fundamental, true understanding might simply slip away from between your fingers. Hello Ashutosh, could you provide a reference for the derivation of the Navier Stokes equations from the hexagonal grid "toy model". I would be interested to see how this is done and a round of searching Google has not proved fruitful. Nice article, very interesting ideas. Sorry, I forgot to add that if you do respond, would you be so kind as to email me: ga7g08@soton.ac.uk. Thanks. It is possible to argue that both Weinberg and Kadanoff are right. While it is certainly very difficult to model a bulldozer with quarks, it is not in principle impossible. And it is possible to predict the color of gold starting at the atomic level, as long as you account for interactions. Emergent properties are a fancy way of referring to properties arising from interactions. It is my sense that when the arrows don't point down it is usually because the interactions are not well understood. In those situations higher level of abstraction that captures the interaction without understanding the underlying mechanism can work as a very useful stopgap solution. Genes are a perfect example. Their existence was postulated and demonstrated long before the structure and role of DNA was understood. However, when the interactions were understood the arrow started pointing down. It is premature to describe most of biology in the language of physics today, but there is little doubt in my mind that some day, long after I am dead, that will be possible. In the mean time we will need to be content with modeling the bulldozer with classical mechanics.